New Year's Resolution: You Can Grow That! The weather outside is frightful, but I'll admit it—I'm spoiled. As a former northern girl, I'm in garden bliss living in zone 7b. In our little piece of garden paradise, Upstate South Carolina's moderate winters allows us obsessive garden types the opportunity to grow year around. With only a minimal investment of time and money, simple low tunnels keep us in produce all winter long. I've always planted fall crops of lettuce, Swiss chard, and spinach, but this is the first year I have three full raised beds crowded with cool weather crops, as well as a potager filled with deliciousness. Along with my tried and true crops, I added cauliflower to the mix. Isn't it so pretty? I hesitated to grow cauliflower. I heard stories that it's temperamental. Challenging. Bug infused. High maintenance. But then, in the throes of garden center delirium, I purchased a few transplants. 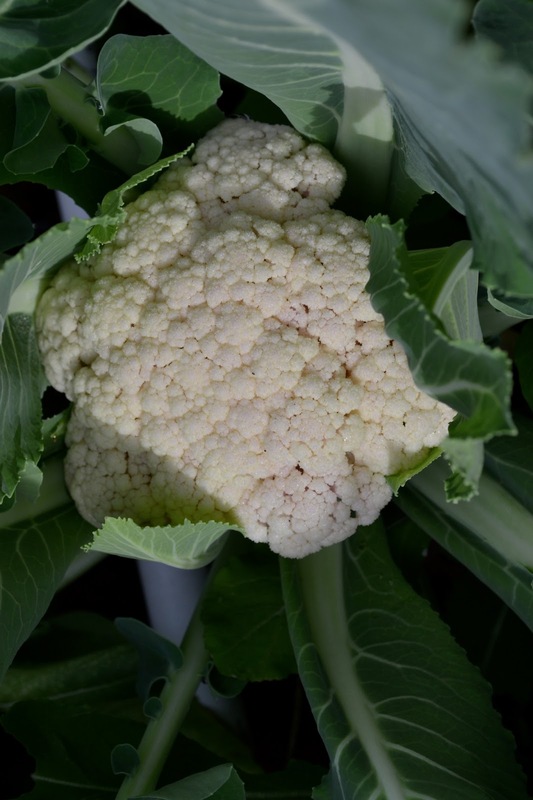 Cauliflower is a member of the Brassica family and grows best in a rich, well-drained soil. Keep pH at 5.8 to 6.5. This cool season vegetable prefers averages temperatures of 60 to 65 degrees. Plant early enough in the season to harvest before temperatures become too hot, or in my case—plant in the fall if your winter is mild or you can install low tunnels to protect the plant from freezing. Space cauliflower in rows that are three feet apart and 18 inches between plants to allow for adequate growth. Water deeply—light watering will encourage shallow root development. Keep consistently moist. Cauliflower is a heavy feeder, and nitrogen is important for the plant to produce a good crop. To ensure the visual appeal of your cauliflower, it's best to shade the heads (called “blanching”) so that they don't become discolored. Some leaves may naturally grow over the forming head to provide shade from too much direct sunlight (which can also make the cauliflower taste bitter). However, a bit of gardener assistance is easy to provide. Gather outer leaves of the plant to join over the top of the head, then clip with a clothespin. After a strong rain, though, unclip so that water isn't standing on the head, which can cause rot. Allow to dry out, then cover the head again. A bit of discoloration typically doesn't affect taste, but too much heat and direct sunlight can affect taste. Companion planting can also assist in controlling pests that enjoy cauliflower. For instance, celery planted along with cauliflower deters white cabbage butterfly and cabbage worms. Aromatic herbs planted near the bed can improve the health and flavor of cauliflower and deters white cabbage worm by repelling egg-laying butterflies. However, please NOTE: Mint can be very invasive! Plant mint in a container and place near the cauliflower. Sage: Repels cabbage flies, black flea beetle, cabbage looper, cabbage maggot. Thyme: Deters cabbage worm, white fly. Wormwood: Repels animals in the garden when used as a border. Repels moths, flea beetles, and cabbageworm butterfly. Harvest 60 to 70 days after planting transplants, when head is fully developed and before curds begin to separate. Leave a ruffle of leaves surrounding the head when harvesting to prolong freshness and quality. Store in the refrigerator. 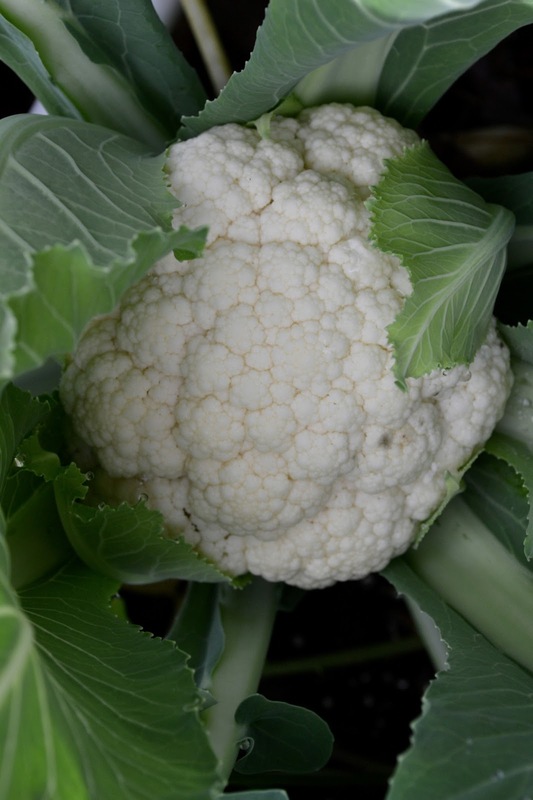 Soak cauliflower in cold water with a bit of salt and vinegar to flush out any aphids. For quick cooking, separate the head into florets. Cauliflower can be eaten raw, steamed, stir fried, or in soup. We tend to simply steam cauliflower or eat it raw. But homegrown cauliflower really deserves more attention, perhaps a celebratory soup for your success in growing cauliflower! Cut off the stem of the cauliflower and any green leaves. Break up the head into florets. Wash them in cold water and reserve a few florets to garnish the soup. Peel and slice the onion thin. In a soup pot, stew the onion slices and the florets in the butter with a little water for 15 minutes, stirring occasionally, without letting them brown. Add water to cover and cook for 25 minutes, covered, over medium heat. Meanwhile, parboil the reserved florets in boiling salted water for 8 minutes or so, keeping them crunchy. Purée the soup in a blender and reheat gently to just under boiling. Add the créme fraîche and season with salt and nutmeg to taste. Serve the soup very hot, garnished with the whole florets and a few springs of chervil. As you sip your delicious soup, aren't you glad that you grew cauliflower? On the 4th of each month, visit You Can Grow That! to discover what other garden bloggers are growing.